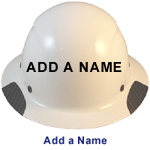 This version of the Carbon Fiber Hard Hat comes with a custom painted special color not available from the factory. While the factory only makes the hats in three colors, we can offer our color added services to match your favorite color, company logo, or specialized hat color for particular job tasks. The DAX composite Fiberglass hard hats built with race inspired technology. Each shell is hand made giving them a one of a kind appearance. This is a top of the line hard hat weighing in at 17 ounces. Click the button below to add the DAX Fiberglass Composite Hard Hat - Full Brim Textured Gunmetal Gray to your wish list.